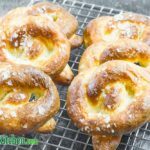 What would a ball game be without a chewy pretzel, you don’t have to miss out anymore with our Keto Soft Pretzels. They are soft and chewy with that beautiful yeasty aroma. When the pretzels are golden brown, remove them from the oven, and don’t burn your fingers trying to eat them immediately.